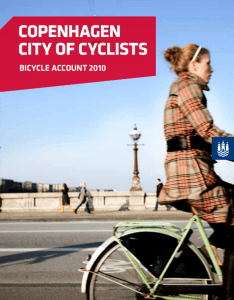 Copenhagen, Aspirational City: With all the progress being made on cycling in American cities, we still have places like Copenhagen to remind us how far we have to go, says Andy Clarke at the League of American Bicyclists blog. The city just released its bi-annual Bicycle Account [PDF], and it is chock full of impressive statistics. Among them: 35 percent of the city’s residents bike to work; 67 percent of cyclists report they feel safe in the city; and 69 percent of residents travel by bike at least once a week. The cycling culture in this city is so well established that one of the biggest obstacles to progress is that the cycle tracks are overcrowded, Clarke reports. The city’s culture of sustainable transportation is paying big dividends, the report notes. Copenhagen researchers found that every mile cycled provides the equivalent of 41 cents in social benefits to the community. Meanwhile every mile driven exacts about 24 cents in costs on society. Biking Cities Better Educated, More Affluent, Happier: Ann Arbor’s Get Downtown blog reminds readers that promoting sustainable transportation alternatives isn’t just an environmental imperative; it can be just as critical from an economic and social perspective. The blog draws on a recent Richard Florida article for The Atlantic, which showed the variety of social and economic advantages enjoyed by cities with high rates of bike commuting, including better educated, more affluent, happier residents. “What I hope this article also shows is that cycling is clearly not just for recreation any more,” writes Get Downtown blogger Nancy Shore. The city of Ann Arbor should be adding bike lanes, sharrows and “Share the Road Signs” as visual cues that the community supports cycling, she adds. How Portland Changed U.S. Cities: Aaron Renn at the Urbanophile offers a tribute to Portland, which he says is perhaps the most influential mid-size city ever in the United States. This sustainable enclave in the Pacific Northwest was far ahead of the curve in sustainability and its leadership has been widely influential.